The aim of WinHost is to give Windows shared hosting that is the most cost effective, they can do well with this because they focus and specialize on Windows shared hosting. With 3 very nicely feature packed plans, there is something for everyone. Their custom control panel makes navigating seem so much simpler. Handling problems is simpler for these guys because they have their own secure data center. It needs to be noted that they don't do long contracts, which is a positive for many. I signed up for a two year plan including domain name registration. My CC number was changed and upon my auto renewal failure that expired my domain. I updated my CC information prior to the expiration of my domain but apparently you have to go in and do a manual update somewhere. I tried to give them a call and they have no phone support. They send system generated conflicting emails about auto renew. Since my domain expired they said I owe $159 to get it back. No humans no care. This is crazy, there are not phone number or way to contact support with using a 1990 forum. There web site has been down for the past 3 hours. They automatically configured my DNS to their email servers, so guess what our email is down now. Just crazy. Look elsewhere if you want .net hosting, sometime you need a live person to get matter resolved and you will not find that here. I was not happy with my experiences with webhosting before winhost. I have a ton of experience with this-so feel confident that I can safely recommend a quality company. In my experience of working with windows hosts-there have been many different types of services to deal with. With winhost I have an easy time. With other-large companies I found that there was plenty of incompetence. I am sticking with winhost. I can easily recommend winhost to anyone. My experience has been that they are a great webhost. I always get a satisfactory response to my support queries. The price is right as well. If you are looking around you won't be disappointed if you come to winhost. I know they will take care of you because my experience here has been extremely easy and efficient. They will support you in whatever you need. For under a tenspot a month-I am getting pretty good service. Likr the silverlight. I am happy so far with what I have gotten from winhost. It only costs me like 10 buks a month and I get access to 4 mysql servers, and a few asp.net sites also. It is easy to publish straight from Visual Studio. I am also able to use the silverlight app that makes life easier. Don't recccomend winhost at all. I DID not take the time to read all the teeny tiny print, so had no idea that they would auto-matically charge my CC to renew. I think getting a reminder of some kind is appropriate before doing a billing. It could be an e-mail. Just that simple. It is very nice to finally be somewhere where my business is valued. They take care of what they need to, the support is great, and the price is fine. I would recommend it if you are looking. Winhost is handling everything quite well, there are no major issues. They aren't over the top good in their support but they hold their own. If you are searching for a host you might give them a try. 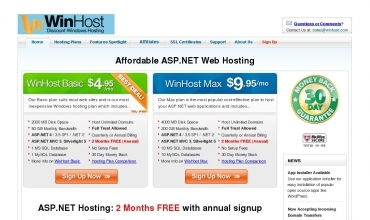 I have enjoyed working with Winhost now for a while. They are competent in what they do and any issues I've discovered have been quickly taken care of. I don't really have too much negative to say about them and would think most people would be happy with their service.